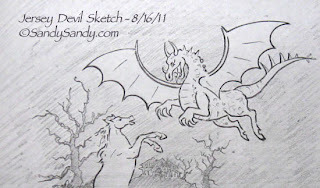 *Drawing Everyday*: It's Jersey Devil Time! Sandy Sandy's Summer Sketching Series - Done Daily From June 1st - August 31st. It's time to start thinking about Autumn and the Jersey Devil here in the NJ Pine Barrens! Every year I do the cover art for the Chatsworth Cranberry Festival program book. I usually do several original watercolor paintings of JD too. I've got lots of sketches flying around the studio here today. Here's one of the ideas, but I still haven't picked my favorites or settled on compositional designs. 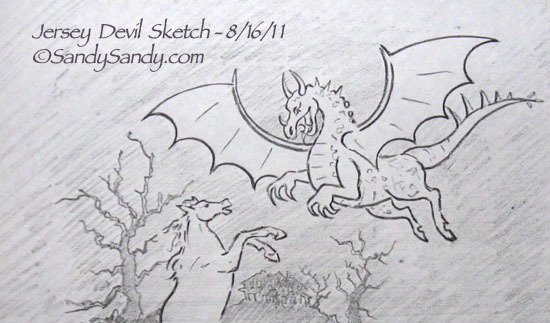 Wonderful sketch, love the Jersey Devil! Post a comment. (No annoying word verification needed!) I really appreciate hearing your thoughts. If you ask a question, look for an answer from me in the same thread where you published your comment. THANKS! I often post the reference for my drawings. This is done intentionally so that anyone who wants to use my photos to draw from can! The only thing I ask is that you include a link where the reference was from and the hashtag #DrawingEveryday and #SketchingEveryday when posted online. Thanks and happy creating! Visit Sandy Sandy Fine Art's profile on Pinterest. Please feel free to share these posts with a link back to the article, but all images are copyrighted by Sandy Sandy. The use of any image from this site is prohibited unless prior written permission from the artist is obtained. ©Sandy Sandy. Simple theme. Powered by Blogger.